My design motivation for the Tarka was simple: “Create a kayak for smaller paddlers for whom the Kasai is just too much boat to handle”. 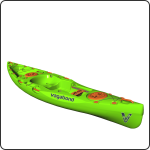 Smaller paddlers need a boat with similar characteristics, just scaled down a bit to make the kayak easier to handle on and off the water. The Tarka is exactly this; a smaller version of the Kasai. The shorter length of the Tarka means that it is physically lighter and therefore easier to carry. For smaller paddlers with a shorter reach, it is also easier to turn on the water. The slightly narrower width means that the Tarka has pretty much the same hull speed as the Kasai; it just can’t carry the same weight as the Kasai. The Tarka has all the same fittings and features of the Kasai, except for the one hatch behind the seat that I had to omit because of space constraints. If the Kasai appeals to you but you fear that it might just be a little bit too big to handle, then the Tarka is for you.